I stumbled across Babouin and Babouine by pure chance during a recent trip to Brittany. While driving through the sleepy village of Trédion I spotted a rather tatty looking sign pointing down a narrow country lane towards ‘Babouin and Babouine – Menhirs Taillés’, which translates roughly as ‘Male and Female Baboon – Carved Standing Stones’. Who could resist such a bizarre description? Certainly not me, so I pulled off the main highway and headed down the single track road to find out more. It wasn’t going to be easy. After a short drive to the edge of a forest where I parked up, I found myself facing a choice of three footpaths leading into the trees. No more signposts were to be seen. I followed the left hand path for a couple of minutes, and then had a change of heart and took the central path. I had no idea of what I was looking for, and after a long but pleasant walk through the peaceful, atmospheric woods I eventually gave up and returned to my car. Babouin and Babouine were to remain an intriguing mystery, for a while at least. Which path to choose to find Babouin and Babouine? Last week I found myself back in magical Morbihan, so after doing some online research I headed straight back to Trédion. It turns out the left hand path had been the right one after all. 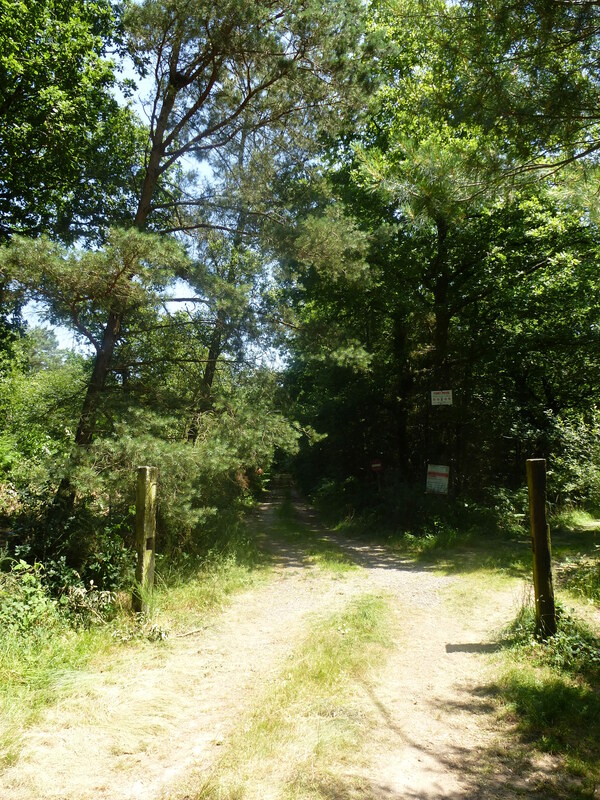 About three hundred metres along it a smaller path splits off to the left. 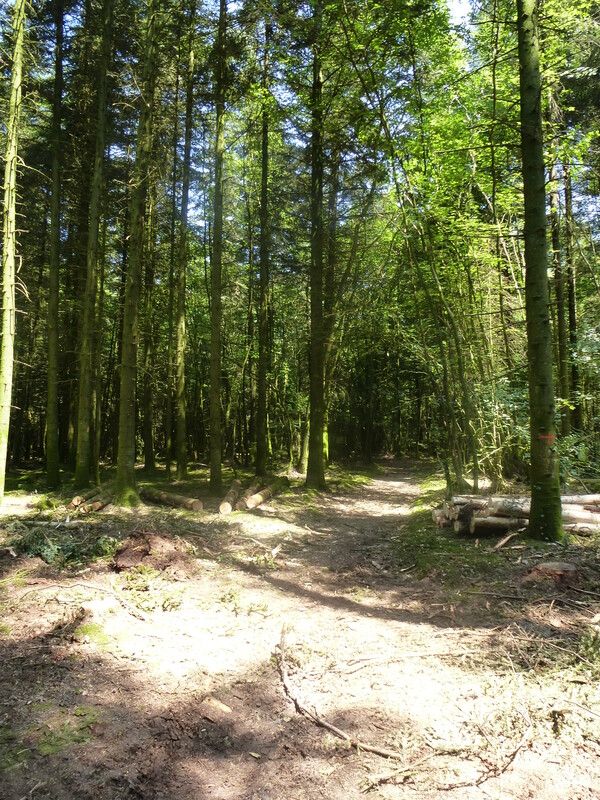 A short walk across the loamy forest floor, past piles of felled trees which were filling the air with the unseasonal piney smell of Christmas, and I found myself face to face (quite literally) with Babouin and Babouine. No one knows the age of these two sculpted stones. No one knows their purpose. 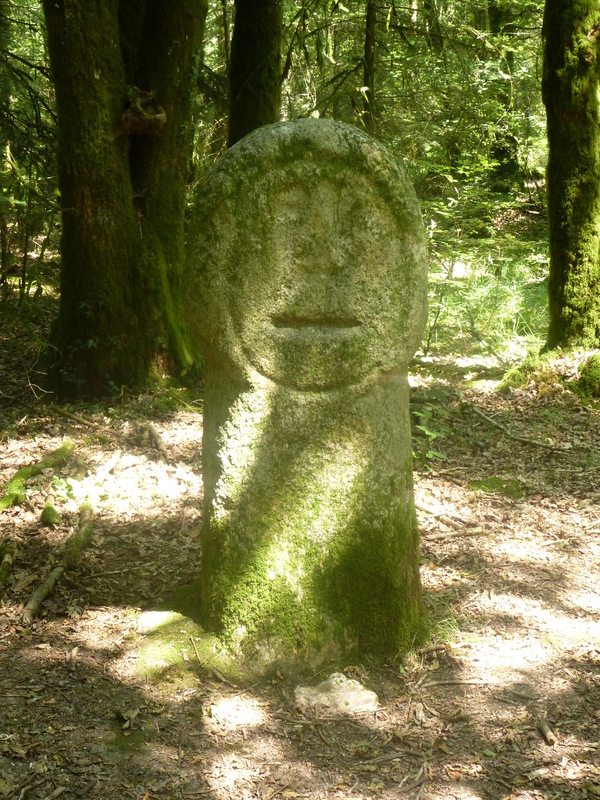 With its wide moon face, Babouin reminds me of Pictish carved heads. It stares, solid and expressionless, giving nothing away. I suppose it is the flat oval features of this menhir that have led to the unusual ‘baboon’ names by which the stones are now known. Babouine doesn’t remind me of much at all – in fact I find it hard to make out a face or figure in the vague shapes of the moss-covered stone, despite claims that is represents a female form. 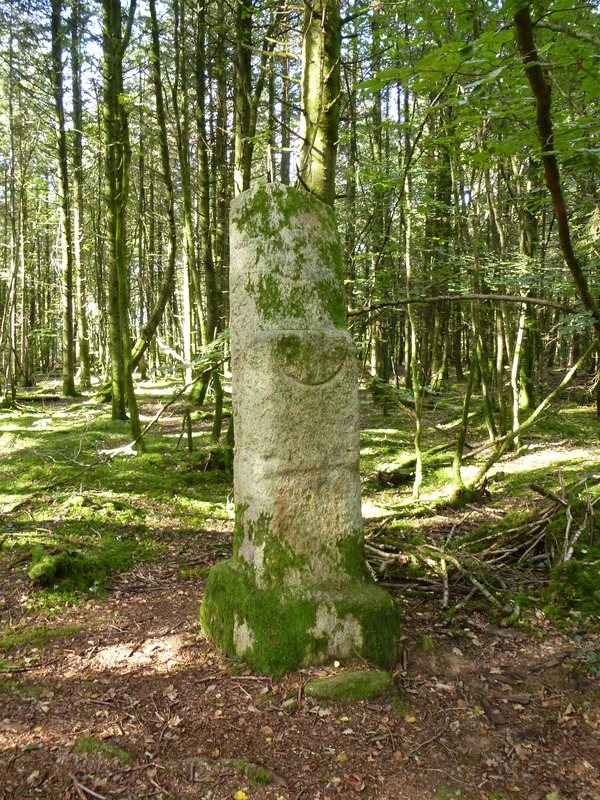 Deciphering the incised lines which decorate the stone wasn’t made any easier by the contrast of the dazzling summer sunshine and constantly shifting shadows cast by the leaves of the forest canopy. Some people think that these two sculptures are ancient, others that they were once typical menhirs which were carved later by some unknown hand into the odd forms that we find today. I guess the true story behind the Babouin and Babouine will always remain a mystery. One thing is for sure – encountering them in the shadowy forest near Trédion, tall and silent amongst the rustling trees, is a mysteriously magical experience.